Pack an emergency kit and keep it in your car in case of a breakdown, or bring it along if you are planning to spend time outdoors, so you are prepared for cold, wet or windy weather conditions that might arise. Avoid doing too much activity and sweating. Sweating increases heat loss through evaporation so you will feel cold. Drink plenty of water. Carry extra water with you and drink it hourly. Do not drink alcoholic beverages. Alcohol interferes with the body’s ability to regulate body temperature. It can cause blood vessels in the skin to dilate, which increases heat loss. Wear loose fitting, layered, lightweight clothing. Outer clothing made of tightly woven, water-repellent material is best for wind protection. Wool, silk or polypropylene inner layers hold more body heat than cotton does. During cold-weather months, keep a full tank of gas and put emergency supplies in your car in case you get stranded. Supplies may include several blankets, matches, candles and some food items, such as granola bars or crackers. A cell phone with a full battery and a charger are essential. If your car is stuck in a snow bank, be careful about leaving the engine running, because infiltration of carbon monoxide inside the car may pose a silent danger. Cold weather is hard on the heart. Blood vessels constrict, which can raise blood pressure and blood can also clot more readily. Frigid temperatures can increase the strain on the heart, and too much physical exertion can trigger a heart attack. Pile on the layers. Dress warmly and try to avoid exposure to very cold temperatures. Use good judgement when you’re outside in the elements. Push snow, don’t life it. Don’t throw snow over your shoulder or to the side. 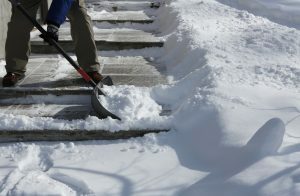 If you have to lift snow, use the stronger leg muscles for support, not your back. Wear boots and the proper equipment. Avoid overexertion and consumption of excess salt and alcohol. If you feel chest pain or other symptoms, call 911 for emergency help. The quicker you seek treatment, the better chance of your survival.